Apparently I’ve never got round to posting this poem on here, for which, I hope, kind reader, your kindest considerations will agree was an error. His wife (that’s Mary) in a state. A dinner so soon at the door. All bound upon a new-bought dress. And he must act so perfectly. In really quite horrendous clothes. So even it can look its best. Has now been cleaned of Yvette’s ink. Relations this time, friends perhaps? Some more from church, or office chaps? “Oh hello, dear. How are you? Well? Her house was back to anarchy. I’ve only just got back from a week in Stratford upon Avon, and thought I’d just post a minor question that has been bugging me since I first saw it. I was lucky enough to visit Kenilworth Castle while in Stratford, and spent a while on the brand new metal stairs that allow visitors to enjoy floors of the castle that have been inaccessible for years. Aside from the amazing parts of the castle that you can now get to, in among the stones dotted with medieval masons marks, there are swathes of 18th and 19th century graffiti, documenting the bygone trips of curious visitors centuries ago. 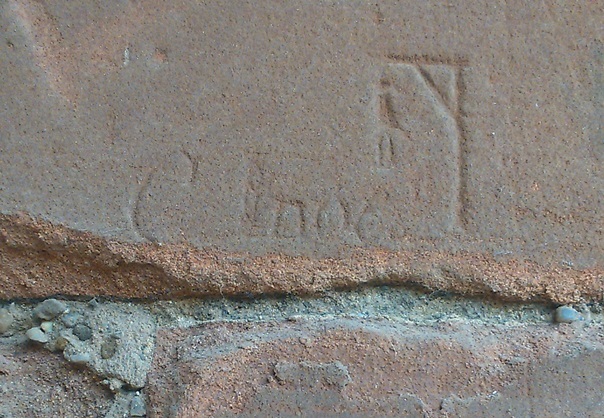 One particular piece of graffiti, written in a style that can’t date from long after the start of the 1800s, was an exceptional and all too familiar jotting. Standing out in the red sandstone was a long-forgotten game of hangman. This is an image of a hanging doodled in a game from a time when public hangings were still common practice, and by someone who may even have seen someone, if not being executed, then perhaps at least hanging in irons and ‘keeping the flocks by moonlight’. A hanging figure would not have been an alien site on the English roadside. But whoever had the misfortune of having to guess this hangman’s word, their attempts clearly failed, and a mysterious ‘C noc’ remains under the completed figure in the noose. Whether there was an ‘l’ once also part of the word is hard to say, since later graffiti may have further defaced the mystery. The only words beginning with a C and containing ‘noc’ that are in the dictionary today certainly were not around even a hundred years ago, so what could the word possibly be? My guess is that the word was mispelt – Chronicle is one of my guesses as to what it could be supposed to say. Since this graffiti may very easilly date to a time before education was commonplace, it is probable that if an uncommon word was chosen for the game then perhaps neither party playing actually knew how to spell it. What an interesting game of hangman that would make! For now, kind reader, I leave you with that mystery. Dr Who was good, wasn’t it?